So far we have used the git resource to fetch down a git repository, and used git & time resources as triggers. The git resource can also be used to push a modified git repository to a remote endpoint (possibly different than where the git repo was originally cloned from). The pipeline.yml does not yet have a git repo nor its write-access private key credentials. Also paste in your ~/.ssh/id_rsa private key (or which ever you have registered with github) into the private_key section. Note: Please make sure that the key used here is not generated using a passphrase. Otherwise, the key will not be accepted and you would get an error. Revisit the Web UI and the orange resource will change to black if it can successfully fetch the new [email protected]:XXXX.git repo. 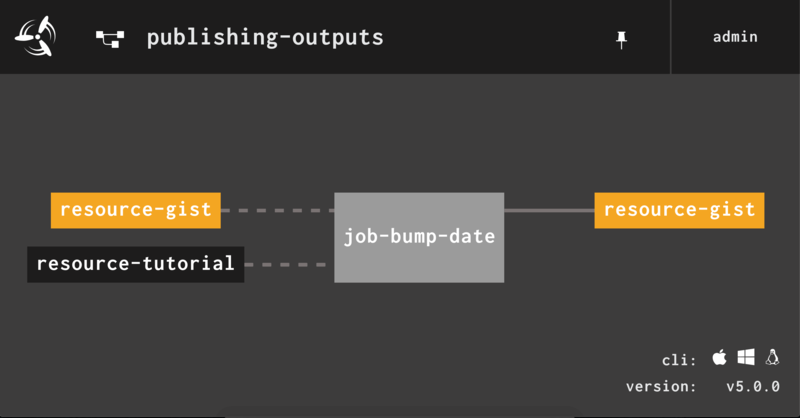 This pipeline is an example of updating a resource. 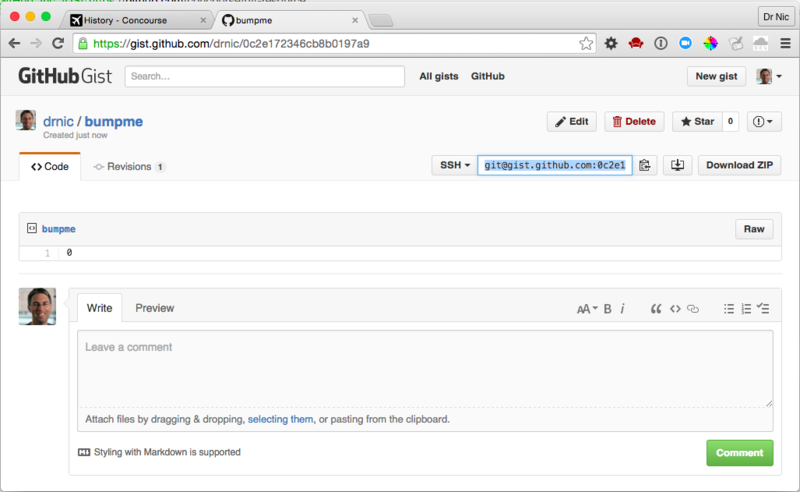 It has pushed up new git commits to the git repo (your github gist). Where did the new commit come from? git config --global user.name "Concourse"
git commit -m "Bumped date"
The updated-gist output from the task: bump-timestamp-file step becomes the updated-gist input to the resource-gist resource because their names match (see the git resource for additional configuration). 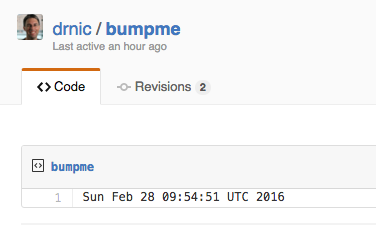 The bump-timestamp-file.sh script needed the git CLI. It could have been installed at the top of the script using apt-get update; apt-get install git or similar, but this would have made the task very slow - each time it ran it would have reinstalled the CLI. 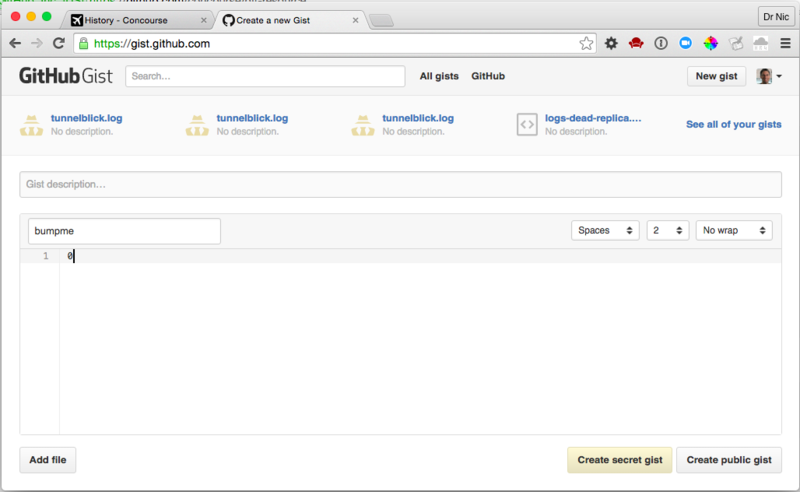 Instead, the bump-timestamp-file.sh step assumes its base Docker image already contains the git CLI. The Docker image starkandwayne/concourse is described at https://github.com/starkandwayne/dockerfiles/ and is common base Docker image used by many Stark & Wayne pipelines. Your organisation may wish to curate its own based Docker images to be shared across pipelines. After finishing the Basics lessons, visit Lesson Create and Use Docker Images for creating pipelines to create your own Docker images using Concourse. If you're feeling ill from copying your private keys into a plain text file (pipeline.yml) and then seeing them printed to the screen (during fly set-pipeline -c pipeline.yml), then fear not. We will get to Secret with Credential Manager soon.